Screencast video: ogg or youtube. This package includes tegaki-recognize, zinnia and wagomu. 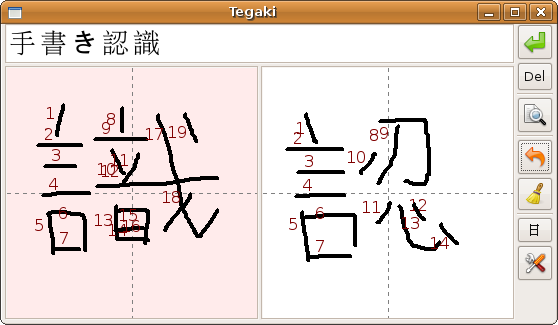 Tegaki on Mac OS X requires Intel processors. In addition, it requires that X11 is installed on your system. If that is not the case yet, you may install it from the MacOS X install disc (it is located in System/Installation/Packages/X11User.pkg) or from Apple's website. For a one-click PyGTK OS X installer that does not require X11, see this site. Handwriting models are not included in the software, they must be downloaded separately. For example, on Windows, models for zinnia can be placed in C:\Program Files\tegaki-recognize\models\zinnia\. Additional models can also be found here. If you are interested in our project, please join our discussion group. Both user and developer discussions are welcome. You can report bugs in our bug tracker.